1) Democracy in name is no good. Indira Gandhi was probably as jittery as an authoritarian ruler. How long did it take democratic India to open up its markets? It did so after authoritarian China. So, democracy in name is no good. I know I will be told that in the longer term it will work out better in India and I agree with that. But, there's also the point that "in the long term we are all dead". Then there are the maoists to consider too. 2) Even UPA may know that 8% inflation is bad but do you think they will implement the "free" democratic solution? Track record isn't promising. 3) The exchange rate comparison is not the full story (its only 2008 onwards). It will be interesting to see when downward movements happen in INR. 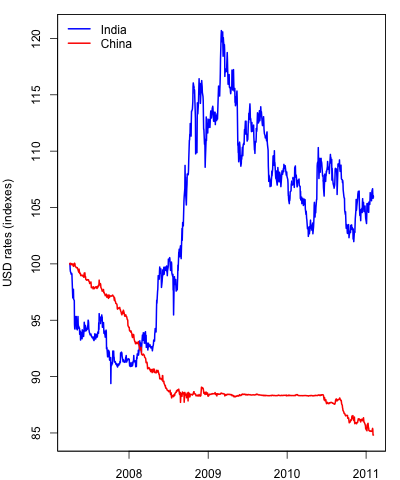 I'm sure China wouldn't mind its currency moving the same as INR in the last 2-3 years. 4) "The exchange rate is the most important price in any economy." There's another price which is as important - the price of money. Why do all democracies fix it? And, why does the US democratic system fix it in such extreme ways? My common point to all of the above is that democracy in name is no good. Kakistocracy/Oligarchy/rogue elites/closed markets can exist just as much in democracies as authoritarian regimes. And, the track record of India as a democracy is worse than that of an authoritarian regime. Want irrefutable proof? Your handpicked examples: Egypt, China and Iran rank better on the Human Development Index than India. This analysis holds good for a democracy like India too. The popular vote percentage does not always accurately get captured by how the seats are divided. The perceived legitimacy of a government can get shaky thanks to coalitional reality. For example, a party like the DMK has been in power through the NDA and UPA governments. Certain individuals have been ministers across governments. The manifesto on which one wins a poll has no bearing on what is implemented when in government. And, when the popular voice of the people gets suppressed, an authoritarian response is to quell the "uprising" by force. We are really large, and our size results in rebellion in portions of India that are of the size of Egypt get dismissed as irrelevant in the larger scheme of things. We have never had a greater sense of an undeclared emergency than we have now. The ability of the State to enter into private lives and intervene has never been greater. While we are a democracy, our people are innately tribalistic and feudal. We celebrate the powerless royalty and hold them in awe. Sections of them have assured electoral victories. Proximity to New Delhi has never mattered more than now since 1991. We have a learning and a warning from the events in the middle East. Not exactly sure you make a case for revolts based on fixed prices. Can we really extrapolate price rigidity of bread in Cairo to entire Egyptian economy? Surely import prices in China changes when prices change in dollar terms - precisely by that change because exchange rate is rigid. These revolts, it seems, are classic cases of political and economic freedoms on a broader scale. Hitler highjacked Democracy and brought us close to total destruction.Indira Gandhi brought monolithic regime through her emergency. Presently every thing is collapsing and people on facebook have started asking,'Do we need a revolution like Egypt'.Anything and everything could be subvereted. Only enlightened people and healthy discussion are the main source of keeping a democracy alive which is the best form of Governance the Humanity has developed. I have to disagree with Anonymous' comments. Leaving his 'price of money' theory aside, I am baffled to see that ..."Your handpicked examples: Egypt, China and Iran rank better on the Human Development Index than India." statement can be easily handled by Democracy Index where these handpicked countries simply don't make the Democracy Index:)!! Either the 'anonymous' wishes to live on Utopia or he is such a perfectionist he would not bear to tolerate issues such as .."democracy in name is no good...". Probably he is confusing with countries like DPR Korea and such like perhaps? Broadwit, that was exactly my point! Those countries are not democracies and still have better HDI. Isn't it time to hold our democracy to higher levels of accountability and to aspire to the core benefits of a truer democracy? I didn't quite understand your point about utopia and Korea. Btw, recently, Taleb mentioned something interesting in his interview to Charlie Rose. He compared the great moderation to Egypt. I think he meant that economists in their hubris thought they could iron out the business cycle by optimizing the price of money. And, it was not very unlike the hubris of Mubarak in setting the price of bread. Both of them led to fragility and extreme events. You may disagree but a thought-provoking comparison nonetheless.